— This article by Jerry Cates, first published on 7 March 2010, was last revised on 22 January 2014. © Bugsinthenews Vol. 11:03(09). The puss caterpillar is the larva of an insect in the order Lepidoptera. More specifically, it is a flannel moth (so-called because the adult moth is clothed in short fine hairs that resemble flannel in texture) in the family Megalopygidae: from the Greek root μεγας (MEG-as) = great, vast, large + the Greek root πυγη (PIDGE-ee) = rump, tail + the Greek patronymic suffix –ιδες (eye-DEES) commonly used in zoological taxonomy to indicate a family name, in reference to a family of moths typically having an exaggerated tail, honoring the fact that these caterpillars often–but not always–trail a conspicuous tail of hairs; this family is presently represented by 23 recognized genera that are found in North America and in the New World Tropics; in North America as many as 44 species — generally described as that group of organisms capable of interbreeding and producing fertile offspring — have been described, some of which may be synonyms, but all of which are known, while in the larval (caterpillar) stage, to produce extremely painful stings in humans who come into contact with them. The species cited most often is Megalopyge opercularis, but a number of other species present a similar outer guise, are equipped with near-identical envenomating structures, and produce a similar sting on contact with human skin. Most are now considered to be members of the genus Megalopyge , but the crinkled flannel moth–also known as the black-waved flannel moth–is classified by some authorities as a member of the genus Lagoa (Lagoa crispata), and by others as Megalopyge crispata. In the material that follows, because the gross features of most, if not all of these moths are essentially identical, no attempt will be made to distinguish between them. The larval stage of this insect is a small (2 cm. long, 1 cm. 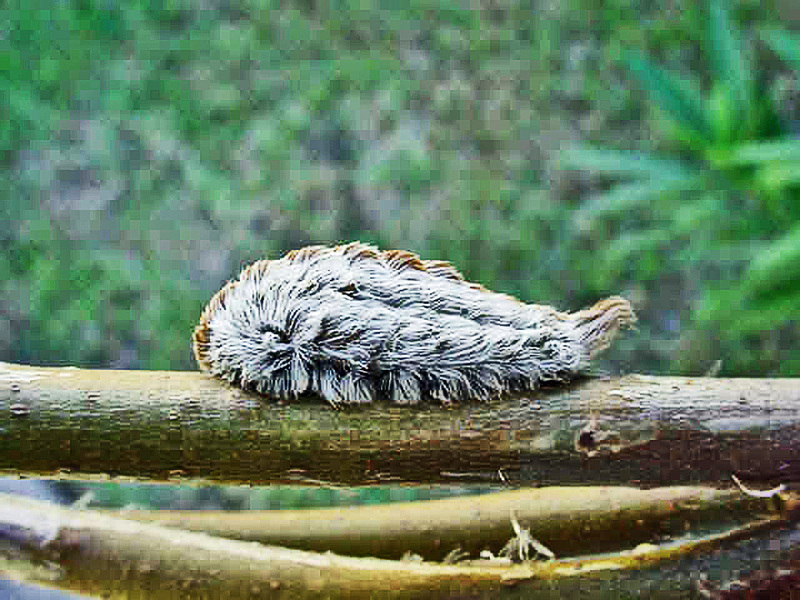 wide), woolly, pussycat-appearing caterpillar. Its innocent, cuddly-looking appearance belies the numerous sharp, venom-laden spines, hidden beneath its luxuriant coat of soft hairs. Because these caterpillars appear as innocuous pieces of fluff, children and adults are tempted to pick them up. Even those who know their nasty reputations find it difficult to believe that these beautifully adorned animals — that have all the earmarks of a benign, friendly, comforting creature —have the power to move powerful, grown men to tears of pain and agony. One touch, however, quells all doubts in a blinding instant of truth. Talk about pain… Wow1 The puss caterpillar knows how to dish it out. Most of the time (some, thankfully, don’t sting, probably because a chance genetic mutation prevents their bodies from manufacturing the venom that otherwise fills their spines. 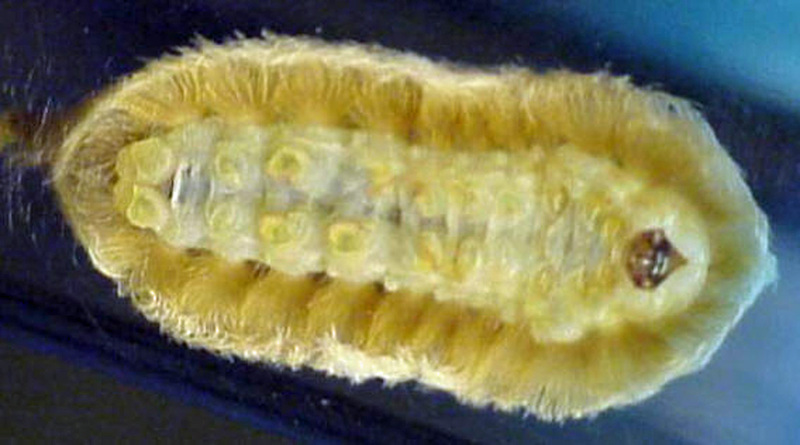 The spines that stick out from each verruca (a Latin word meaning “wart”; in this case a glandular excrescence on the skin of the caterpillar that houses venom glands and is adorned dorsally with sharp, hollow, venomous spines) on the body of the caterpillar usually , but not always, induce an immediate onset of excruciating, unrelenting pain. The pain usually radiates rapidly to the lymph nodes in the armpit or groin, and then to the chest. Though only rarely representing a true medical emergency, these symptoms have the feel of a genuine, serious, life-threatening event. 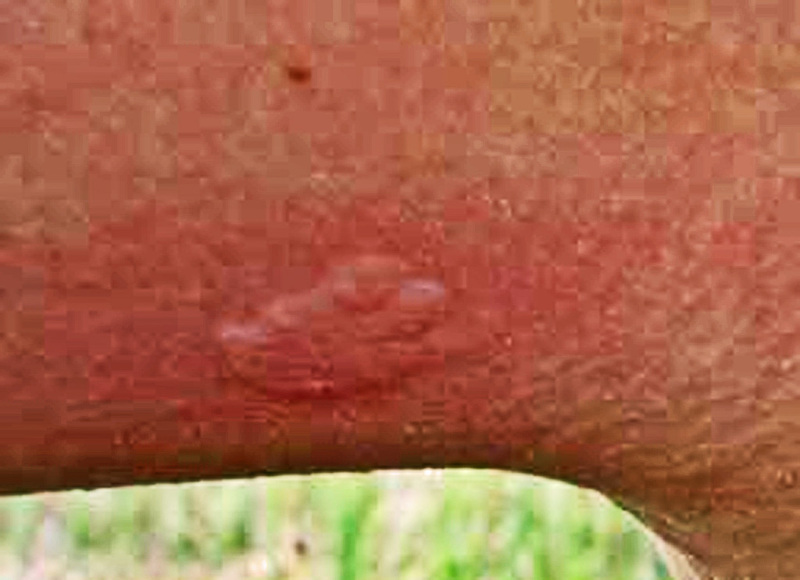 As a result, it is common for victims of puss caterpillar stings to seek medical assistance at hospital emergency rooms, where they hope that the E.R. staff will be able to apply appropriate medical interventions. Sometimes Emergency Room physicians, nurses, and EMTs recognize the puss caterpillar’s distinctive sting wound immediately, but — surprisingly often — these personnel have no knowledge of the puss caterpillar or its sting, much less of the most effective medical interventions the sting calls for. Individuals who go to emergency rooms for treatment of puss caterpillar stings may be misdiagnosed by inexperienced medical personnel as suffering from a wide range of acute and generally serious medical conditions. Within minutes or hours of the sting event, a halo of reddened skin, caused by capillary congestion, forms. The reddened tissue is locally sensitive, painful, and warm or hot to the touch. 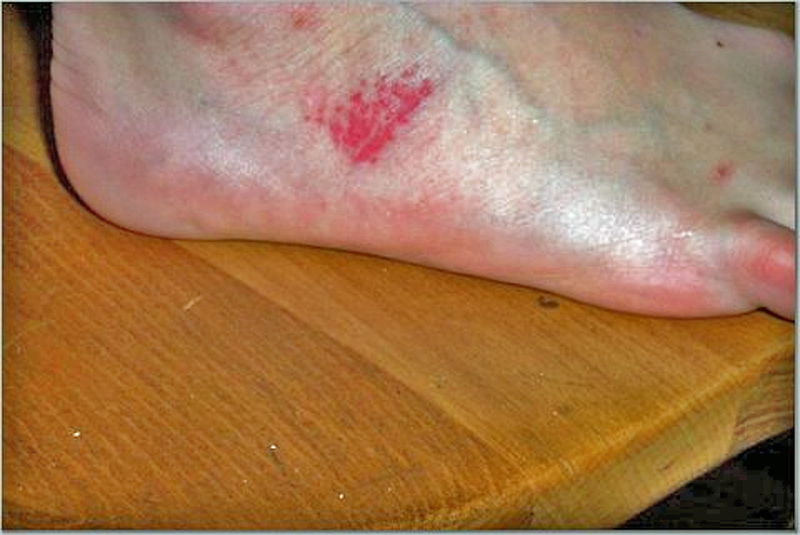 The skin remains reddened but otherwise unmarked for minutes or hours. 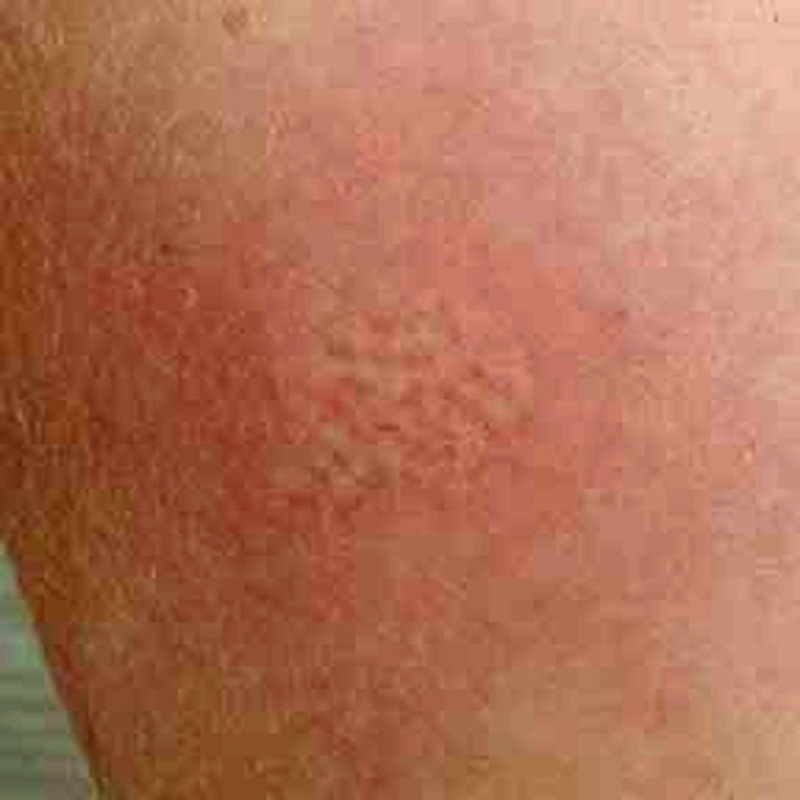 As the local redness subsides, a pattern of darker, raised, nodular lesions forms, usually within 24 hours after the sting. These darker lesions are arranged in a characteristic pattern. The sting pattern varies based on which portion of the caterpillar touches the body. 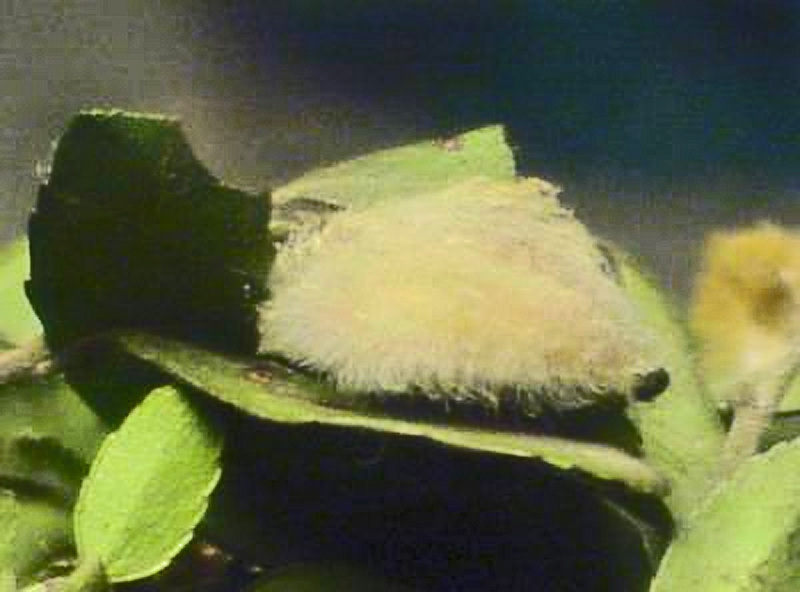 The puss caterpillar’s underside is shown in the photo at left. This portion of the caterpillar contacts the surface of the caterpillar’s track as the caterpillar crawls along. 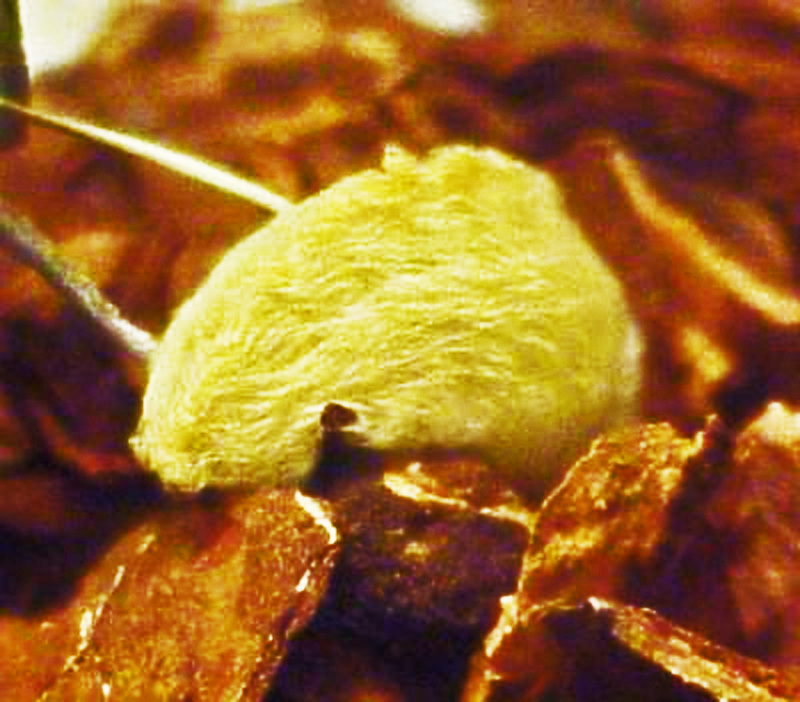 Note the way the hairs along the edges of the body emerge from swollen “warts” or verrucae (raised tubercular ridges, arranged along the median of each body segment). Though the soft hairs themselves are harmless, these same swellings also sport a multitude of sharp, venomous spines capable of injecting the caterpillar’s venom into the skin of a sting victim. If the underside is pressed against the body, the visible sting pattern (that shows up later) will follow this shape; if one side of the caterpillar is involved, the sting pattern is usually that of a crosshatched triangle, with each of the verrucae involved in the sting showing in the pattern. If the upper surface is pressed against the skin, the sting pattern is that of a crosshatched oval. The sting pattern usually begins to show within 24 hours, but the full pattern may not be expressed for hours or days after the sting occurs. The photos below show puss caterpillar stings on a right foot foot (L) and forearm (R). The lateral (side) surface of a caterpillar had been crushed against the foot, while the stings on the forearm were caused when the upper bodies of two caterpillars were crushed by pressing the arm against a railing where the caterpillars were crawling. Note the regular pattern of dark red spots in the photos; these spots correspond to the verrucae in the body of the caterpillar, showing where the concentrations of fragile, venomous spines penetrated the sting victim’s skin. In the majority of cases, these spines break off during penetration and slowly release their store of venom as long as they remain embedded. Each spine, as described by Nathan C. Foot in his 1921 paper on the subject, is one-third to one millimeter long, and 15-45 microns in diameter. Such microscopic structures cannot be seen with the naked eye. However, because human flesh tends to push embedded foreign objects outward, even spines that have penetrated deeply will move toward the surface of the skin–where they may be extracted manually–within a relatively short time. This fact figures prominently in the treatment options that should be considered when dealing with a puss caterpillar sting. These photos were taken several hours after the sting event. Questions? Corrections? Comments? BUG ME RIGHT NOW! Feel free to e-mail jerry.cates@bugsinthenews.info. You may also leave a detailed comment in the space provided below. My Dad worked as a extermnater and my mother stepped on 2 of these when we were on a swimming outing. One was purple with spines down the midfle of its back, the other one was a bright yellow. My mother went into cardiac arrest, and would have died had it not been for my Dad.he knew what poison, so it didn’t waste time. http://bugsinthenews.info/?p=476 This Picture Is From Northern Kentucky At My Cousins House Hope You Can See It. It Is A Puss Caterpillar. What does the crysillis look like? We have had long 1 to 2″ or so hanging off our fence around the pool, on the bird houses. They are cone shaped and very hard to detach. You have to cut them off. I live in NC and this is the first time we have had them. I am in NW Florida. The part underneath Alabama. I found one in my garden a few years back. Never saw one before and I’m one who ‘Grabs first and thinks later’ yes, I did touch it to see if it would move. My hands and fingers are extremely calased in the summer from yard work so I had no reaction to the hair. The information mentioned that they aren’t found North of Maryland, however several people in Pa, NY, and NJ have reported they have them. A short time back I was walking on a boardwalk trail on The Peace River near Fort Meade, Florida and when I stopped to look around I placed my arm on the rail, on top of an asp. I immediately felt a sting and only minutes later my husband had to carry me back to our vehicle, where he immediately put sting ease on the swollen / reddened area where I was stung. I actually felt dizzy and had difficulty breathing, at one point I almost vomited. My husband wanted to take me to the hospital but I refused and eventually started to feel better. I have been stung a lot of times by wasp and such but this was the worst pain I have ever felt. It is hard to believe that anything so small could cause so much pain. OMG there back we had no idea what they were we live in New Orleans and this is a first for us they are in our yard and eating all of my plants (even one that should not be there shhhhh) so happy my motto is to stay away from all bugs the baby has not been stung but we keep him out of the backyard. How long can we expect to have these visitors? And will they turn into moths and fly away? Will they multiply? they are various sizes and some look like babies. And, are the flies still the best method of extermination? Thanks for the website i will use tape before anything else. Houston, Texas. During early November I noticed several short 3/4 inch long light grey fuzzy caterpillars that were climbing on my garage door and back doors of the house. I had not seen them before and left them alone. Two weeks later I lifted my garbage can lid and accidently brushed my right thumb knuckle against one that I did not see. It felt like a stinging nettle and produced a white slightly raised half inch long mark. Within a minute I washed off my hands and opened a protease capsule and made a paste with Shegoi spray(a liquid from the Larrea Tridentada plant-Chapperel Plant) and smeared it on my knuckle then sprayed DMSO on it to help it penetrate the skin. It kept stinging and the thumb was turning red up to my wrist and was throbbing. My thumb and its 2 joints were rapidly swelling and getting stiff. I could feel tenderness traveling into my index finger. I took 2 Benadryl right away and 2 protease capsules. Protease digests the protein in venom and the Shegoi reduces inflammation and pain. The stinging went away quickly but the throbbing and swelling continued. The thumb doubled in size in 30 minutes. I took 4 more protease and the throbbing eased within 10 minutes. I got on the Internet to find this stinging caterpillar. I looked at 200+ grey fuzzy caterpillar pictures with not one matching the ones in my back yard. One picture was close and the comments with that picture mentioned 4 other types of caterpillars that were similar in image. When I looked up each one I found a Megalopyge Crispate image to be the one that stung me. By then 3 hours had passed and the 6 Protease capsules and Shegoi/Protease poultice almost got my thumb back to normal size and reduced the stiffness and red skin. I also found Jerry Cates BugsInTheNews site and got a great education on the poisonous puss caterpillar that stung me. I took his recommendation to use at least 15 strips of scotch tape to remove the invisible spines that were unknowingly still there. I read every article Jerry wrote and learned so much about natures way of killing these puss caterpillars. I also learned that Olive Oil was another thing I could put on a sting. Cool! Jerry, thanks for your dedication on this little known venomous caterpillar/asp. My home remedy worked for me. Horrifying what others have gone through with hours of pain, temporary paralysis, and other complications. After 17 years of living in this home this was its first visit by the puss caterpillar. Wow…that cute little fuzzy critter packs a serious punch! I won’t be using pesticide sprays after learning the way nature (a type of fly) kills the caterpillar when it ingests fly eggs on the leaves of the infested plant/tree. Nifty! Connie: Thanks for posting your comments. Others will learn much from your experience. Lakechia: New Orleans seems a favorite place for these caterpillars, though even there they tend to be scattered in isolated infestations. Mother nature’s remedies (Tachinid fly predators) still appear the most efficient means of dealing with them, so don’t use pesticides to try to kill them on the plants you are fining them on as the pesticides kill the flies more efficiently than they kill the caterpillars. My story of the asp caterpillar is a life changer or so I and others believe to be true. I was stung about three years ago while in a sound sleep while at a friend’s home in Mesa, AZ. I felt queasy upon getting up, felt rather off and a horrible itching that I put ITCH-X on so I could eat and get to the bus depot. It itched more and more and I felt ill with nausea. I was in a drunken state for about 6 weeks or more with friends very worried about me and so was my family. A couple of weeks ago another deep piece came up that felt like a small splinter. I am a compromised immune system and wonder if some of the ensuing problems are related to being envenomated. I developed severe and instant diarrhea which led to a diagnosis of collagenous colitis, now I have heart issues and the fibromyalgia which had been under great control whacked me out once again and I have not fully gotten back to what I previously was. Do you know of any cases with very long term effects? I saw one comment where a woman went into cardiac arrest so this is serious stuff.